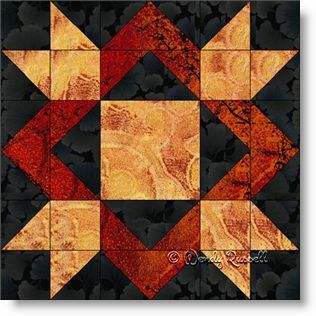 The Royal Star quilt block might look vaguely familiar. It is quite similar to the Weathervane block, but with additional flying geese patches replacing the rectangles. Personally, I don't see a "star" as the name would indicate, but it is a pretty block. An added bonus is that now you have two more suggested layouts for whichever block you choose to make. Half square triangles also make an appearance in this nine patch block. These two pieced patches mentioned are the most commonly used units (other than the square) in quiltmaking. The two sample quilts illustrated both use an on point setting of the blocks. But, as you can see, you can achieve entirely different looks in your personal quilt.